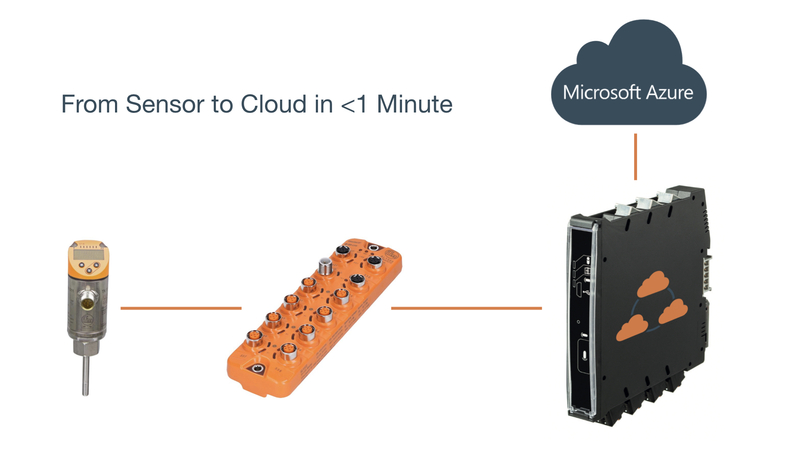 In this video tutorial, we’ll connect a temperature sensor from IFM (TN2511) with Microsoft Azure in just 58 seconds using the CloudRail.Box. Since the IFM sensor uses IO-Link, we also use an IO-Link Master from IFM (DataLine AL 1322). The goal of this quick tutorial is to transmit temperature values (in this case the temperature of our coffee) into the Microsoft Azure IoT Hub every second to display it in a basic chart. As you can see in the video, the CloudRail.Box works seamlessly together with the IFM hardware. The IFM IO-Link Master as well as the IFM temperature sensor is automatically recognized as well as configured by the CloudRail.Box. A true Plug&Play experience for industrial automation devices. In this video we used Microsoft Azure as a sample. The cloud configuration follows the same easy Plug&Play experience as with the IO-Link Master and Sensor. Select Azure, name the device and you are done. You’ll even get a quick instruction how to use the sensor date within the cloud platform. Besides Azure, which we used for this video, the CloudRail.Box also supports Amazon Web Services (AWS), IBM Cloud, Google Cloud Platform, SAP IoT and Alibaba Cloud IoT with more coming soon.